This article first appeared in The Edge Malaysia Weekly, on June 19, 2017 - June 25, 2017. The Edge: You are quite confident that Barisan Nasional (BN) can be defeated. Where does this confidence come from? 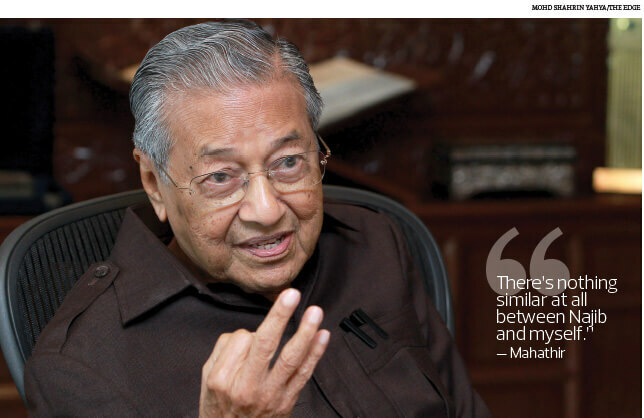 Tun Dr Mahathir Mohamad: In 2004, BN did extremely well and that was supposed to be because of the new prime minister, Tun Abdullah Ahmad Badawi. But in 2008, Pak Lah lost five states. [When] current prime minister Datuk Seri Najib Razak took over, we expected him to do better but, very surprisingly, [he[ did worse. There were a lot of things against Pak Lah [in 2008] but in 2013, Najib did not have too many issues. Today, there are many issues. One is, of course, 1MDB (1Malaysia Development Bhd)… billions of dollars have been lost and there is no proper audit and [there is the role of] Jho Low. These are issues which even people in the village now understand. The assumption that they do not understand is not valid anymore. They understand, at least, that huge sums of money have been lost. Then, of course, there are the things which have burdened the people [directly]. We have the goods and services tax [GST], unemployment, reduction in the number of scholarships, less infrastructure being done except for the mass rail transit and light rail transit [projects]. The high cost of living is disliked by a lot of people... ikan kembung costs RM18 per kilo... there are so many issues that the government cannot possibly answer. Then there is this sale of Malaysian land to foreigners — the sale of [power assets of] Edra [Global Energy Bhd], which are energy assets owned by Malaysians, to foreigners. And with respect to China, the government’s action is not to be non-aligned any–more where, before, we were free to be neutral [in our foreign policy]. Other issues include [poor] management of Felda and Tabung Haji, loss of money by Retirement Fund Inc (KWAP) and SRC [International Sdn Bhd] — all these things will be issues the government will have to handle in the election. The Felda issue is about how FGV (Felda Global Ventures) performed since the listing? Felda people have lost money. Settlers were asked to buy the shares at RM4.40 and now it’s down by a few ringgit. Yes, but believe me, it’s not as shaky as made out to be. Yes, we have internal problems and we have inter-party problems, but we have got together and Bersatu has become part of the coalition. We accept the leadership of the presidents of the parties, we are working on the constitution, we are going to use one symbol for our party, we have agreed that we should field only one person for each constituency — all these things have been agreed but, of course, the next move is how many seats for whom, and where. There may be some disagreements on other things but all have become minor relative to the need for Najib to be unseated. In this scenario, where does PAS fit in? PAS is a spoiler, it has always been a spoiler, it has never achieved anything. What has PAS done for Islam except to weaken the Muslims? They did not create the Islamic university, Islamic banking, the Takaful or Tabung Haji to facilitate haj, for example. All these were not done by PAS. They have condemned people who do not join them as being infidels — kafir — and that serves to divide and weaken the Muslims. They have been able to split the Malay Muslim votes, so much so that they too have become weakened. So, you are not seeing [PAS splitting from Pakatan] as an advantage to Umno? It is an advantage to Umno, of course, but even if PAS were to join the opposition coalition, they might demand a huge number of seats, which they cannot win. Historically, their performances were good only when DAP supports them and it is part of a coalition. Indirectly, [PAS] is now working for Umno. What do you think about the East Malaysian states, Sabah and Sarawak? Sabah and Sarawak are very insular. They talk about Sarawak for Sarawakians and Sabah for Sabahans, which is one reason we have not gone there. Umno is not popular because it is regarded as a peninsular organisation. So, we are leaving that to them (Sarawakians and Sabahans) to decide. There is a view that the voters are facing political and election fatigue. I don’t know about fatigue, but from the number of people who attend all these rallies that we have, they don’t seem to be tired at all to hear me talk about 1MDB and other issues. I must admit that even as president of Umno, I never had that kind of audience, and most parties never get that kind of audience. But today people are incensed at the government. So, it can’t be because they are tired. They are not tired; they are looking forward to this general election. The country can borrow money, but it can borrow money only when it can repay, and the money is to be invested. It is quite clear that the money borrowed cannot be repaid. A country should have a deficit up to a certain amount but not so much. IMDB borrowed over RM40 billion but has recovered RM12 billion by selling Edra energy assets, which used to be owned by Malaysians but is now owned by foreigners. The government wants to borrow RM55 billion for the East Coast Railway Line (ECRL), and for the High Speed Rail (HSR), the quotation given in the newspapers range from RM40 billion to RM80 billion. We cannot afford these things. It will take you 30 years to repay the loan, so it is a serious matter. Don’t say it is a small sum. But the ECRL is an infrastructure project. These are not infrastructure projects as they are not necessary. To travel from Kota Baru to KL by train [now] will take you almost 12 hours, but people can fly. Today, low-cost airlines fly between Kota Baru and KL and many other places, and it takes half an hour to go anywhere from Kota Baru. Why should they take the rail? The east coast is not well known for producing a lot of goods to be transported by rail. It doesn’t make sense as the greater consumption is in the west [coast]. Why should you produce in the east? You only increase the costs; besides, if you want to export, there’s Kuantan Port. Why do you have to build a railway to Port Klang when Kuantan Port is there? Just imagine, you borrow RM55 billion to finance the construction and buy the rolling stock from Chinese companies, because they are now tied to the Chinese companies. And after [we] have paid for all these, [we] still have to pay for the money [we] owe, which is RM55 billion. How do you pay that? It is not easy. Borrowings are all right if you can use money to make a profit. You don’t borrow to spend. It is very damaging. Even for yourself, you don’t borrow money to pay for your food every day. You borrow money to invest, yes. We can learn a lot from China, they have made tremendous advances. But learning from other countries does not mean selling our assets to them. The Japanese did not buy our assets. We sold small parcels of land to build factories… that is a foreign direct investment. But that is not selling property. The factory is important as it creates jobs for our people. But here you are selling land for people to build cities where they can come and live, which is not foreign direct investment; it is selling assets. But there are some quarters who think that during this economic slowdown, it’s good to have foreign direct investment from China, notably to build infrastructure. That is not foreign direct investment. Foreign direct investment is about capital and technology coming in here to produce things in Malaysia and employing Malaysians, with Malaysians running the companies. Now, money [is] coming in mainly to buy land, property and to develop cities where we cannot live in because it’s too expensive. It’s going to be lived in by expatriates, so how do we gain? When Pak Lah took over, they were saying you had spent too much, and the country was broke. What is the proof that the country was broke then? I left the country with three conditions: first, I wanted the party (Umno) to be in good shape; secondly, I wanted the economy to be in good shape; thirdly, I wanted the government to have sufficient money to run the country together with development of the country. I didn’t leave the country in shambles. How is the present state of the economy? The present economy is not well managed and the [focus] is on being popular. To be popular, you increase the number of civil servants and pay them [big] increments. I never gave any increments of more than 10% and they have been giving up to 25% [over a period of time]. That is why the salary bill is so big, and that is why we don’t have the money for development. Given the current economic environment, if you were the policymaker, what would you do to minimise the adverse impact for the man in the street? There are a lot of things that can be done. This country is a fantastic country. It doesn’t take much skill or cleverness to develop this country. When I stepped down, I had a lot of ideas, but I thought I had been in power too long, so I gave a chance to other people; of course, I expected them to at least carry on with some of the projects I put in line, but they decided to change policies. Critics say Najib is doing what he has learnt from you. There’s nothing similar at all between Najib and myself. Voters are asking what the opposition can offer if they become the government. Good governance. That is the most important thing.